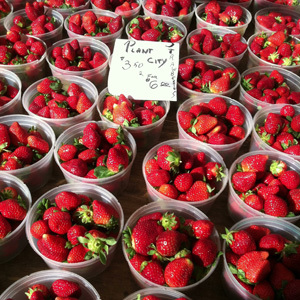 Like juicy strawberries? Thank a pollinator. 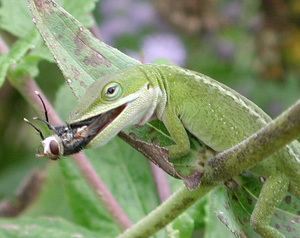 Anoles think pollinators are delicious! Back to pollinators. Humans aren't the only ones on the receiving end of their services. They are ecologically advantageous as well. Pollinators keep our plant communities (re)productive and are indicators of healthy systems. 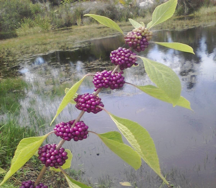 Their assistance with seed production facilitates the production of plants that can stabilize soil (willow) and colonize disturbed habitats (goldenrod). They can bore holes in weakened tree limbs to initiate decay (which is a good thing), are tasty snacks for birds, lizards and spiders, and assist in the creation of the fruits and seeds that both mammals and birds like to nosh on. But wait - there's more... Pollinators can help with pest management! It's true! Syrphid fly larvae, for example, just can't get their fill of aphids. 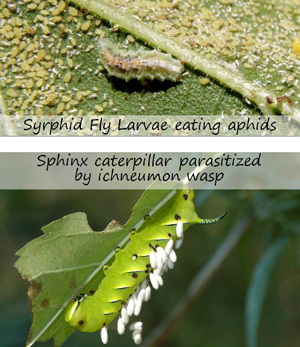 Parasitoid pollinators (tachnid flies, brachonid and ichneumonid wasps) lay their eggs inside plant eaters like caterpillars and aphids. It's like Alien, only better - because it's REAL! So what's the difference between native and non-native pollinators? Isn't a half dozen of one as good as six of the other? In one word: NO. Non-native pollinators may use up resources intended for native pollinators without contributing to the pollination process. For example, a new hawkmoth species was brought into the western U.S. with the intention of using it in I.P.M. (Integrated Pest Management). The goal was for its caterpillars to eat off a rather invasive type of spurge. As it turns out, its adult form has a proboscis (tongue) long enough to nectar on a Platanthera species of orchid without bumping into the orchid’s pollinia, whereby reducing its incidence of pollination and seed set. That's a big deal - particularly when the orchid species in question is dwindling. Consider this as a prelude. I'll elaborate on the native and non-native pollinators in a bit, so sit tight! Perhaps before going any further it would be good to briefly review the pollination process. How does pollination work in flowering plants? Essentially, pollination is fertilization, so we have male and female parts that work together to fertilize a seed. The female parts are collectively called the pistil, and contain a sticky or feathery end called a stigma, a style, which is basically a tube, and ovaries. 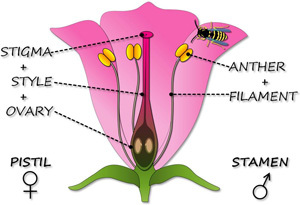 The male parts are collectively called the stamen, which is easy to remember if you notice the word “men” in there. 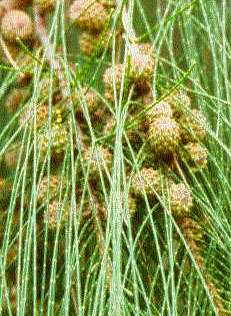 These consist of the anther, which contains the pollen, and the filament. Not all flowers have both male and female parts. Those that DO are referred to as either bisexual or perfect. Although some plants can self-pollinate, most require cross pollination, which is the movement of pollen among flowers on different plants. This results in a mixing of genetic material which produces successive generations of more robust plants. Nectar guides - these are markings on a flower that show a pollinator the way to its nectar. To insects like bees, these may appear to glow. Color - Not all pollinators can see or smell the same things. Bees can distinguish only four different colors in the visible spectrum: yellow, blue-green, blue, and ultraviolet (which we humans can't see). They are red-blind. It follows that most red flowers are pollinated by either hummingbirds or butterflies. Fragrance - Although it is the subject of debate, many scientists have confirmed that most birds are unable to smell. As such, hummingbird-pollinated plants generally have little fragrance. Amount of nectar/pollen - Pollinators aren’t just pollinating to be nice; they’re searching for food, either in the form of nectar, a carbohydrate, or as pollen, a protein. Plants that are wind pollinated have no need to create nectar or produce showy flowers... these activities would be a waste of precious energy. For this reason, wind-pollinated flowers are usually pale green or brown, loaded with pollen, and nectarless. Shape - the shape of a flower and position of its nectaries should fit its pollinator’s pollinating apparatus. This means tubular for hummingbirds, relatively shallow for bees, and with a spur for butterflies and moths with a long proboscis. Time of day open - If there’s one thing that probably most of us have seen, a light turned on outside at night attracts moths. this is because they are nocturnal creatures. At night, white is the most visible color flower. Flowers that are fragrant and open at night like moonflower are usually pollinated by moths. 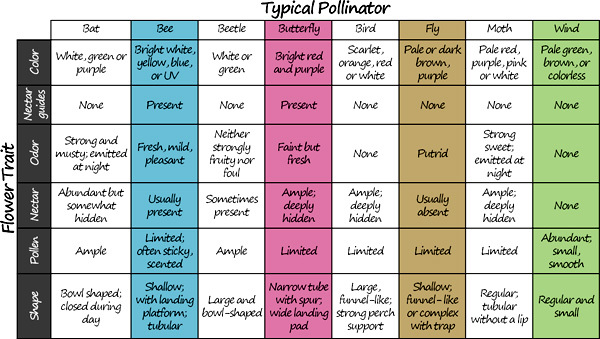 This chart shows the standard pollinator syndromes, although, as most of us are aware, few things in nature are so cut and dry. It's sometimes right, and sometimes wrong, but it gives us at least some sort of foundation for understanding what the various pollinators are attracted to. Creating habitat for pollinators means much more than knowing which color flowers a given insect is attracted to. It involves knowing the life span and understanding the forage and shelter needs of each individual pollinator at various stages of life.We will delve into that subject (and more) in part 2 of this blog, so stay tuned! I'm trying to learn more about the biology of food,agriculture to teach my grandkids about the importance of the ecological food chain. Thanks good read!